Talladega Superspeedway today will announce the largest renovation in track history, a $50M project that will redo 90% of the infield into what is hoped to be a more fan-friendly, interactive area. 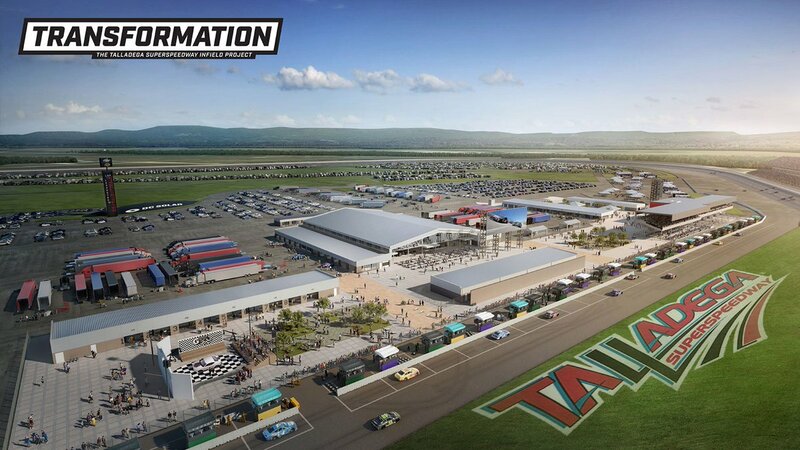 Talladega has scheduled a press conference for 4:00pm ET today to announce what is being called "Transformation -- The Talladega Superspeedway Infield Project," but the ISC-owned track provided renderings and details exclusively to THE DAILY ahead of the unveiling. The renderings show a new garage with 44 stalls on the outside of the structure, four 25-person suites and a fan walkway area on the inside. The idea was to build garages that give fans better access to a previously off-limits area, and it is also being deployed at renovations at ISM Raceway and Richmond Raceway. However, Talladega's setup is unique in that the fan walkway is in the middle of the garage stalls as opposed to being on one of the backsides, something that track Chair Grant Lynch said "has, to my knowledge, never been done in sports." The new garage will be for the Monster Energy NASCAR Cup Series teams, and Xfinity Series teams will now use the current Cup Series garage.